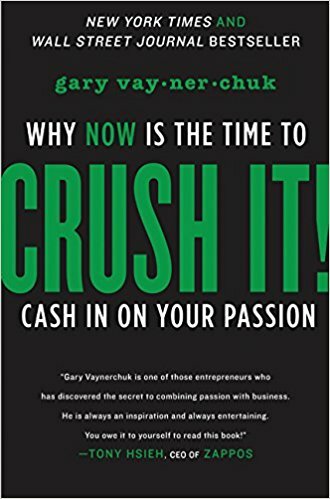 One of the best things that I did yesterday was to find this treasure of a book ” Crush It “ by Gary Vaynerchuk amidst the 100 other titles in the bookshelf of the library. Just like the picture above, this book stands tall in the meaty values it provides to the reader. As we all know, Gary Vaynerchuk is an epic entrepreneur and is the king of personal branding. He brings out his authentic self in every platform and he owns it. 1) You get into the world of the author and understand what worked for him and how he helped leaders achieve greatness through his wisdom. 2) The author gets into your world and talks sense into you. Gary is the second type (he talks talks talks a lot right into your ears until you take a step in the right direction). It is always exciting to read the journey of an entrepreneur from the man himself and you get an inside peek of how he built his empire. The book slowly moves into how he leveraged his social media and built a very strong personal brand. This book is a little over 135 pages and since it is highly conversational, you will be done in less than a couple of hours. Importance of building your personal brand, creating great content, choosing a platform, creating a community, monetizing and creating a legacy – all of the above are discussed shortly but is very effective coming from the author. This book has come out in 2009. It’s been 8 years yet it is highly relevant on all areas. Just like his vlogs and interviews, this book is an honest account of how he scaled his family business, created the winelibrary tv, aced personal branding and started a media agency. 1. It is highly authentic and the tone is super casual. 2. Never a dull moment and everything is short and direct. 3. Quirky business models and a full-fledged thought process about scaling it from the man himself. 4. The super useful checklist at the end which you can take a picture of, stick it somewhere and repeat the task sets. 5. Bursting many myths related to generating revenue from your passion. Who is “Crush it” for? 1. Anyone who has just an idea and wondering if he/she should pursue the same. 3. Anyone who is looking to create a personal brand from scratch. So now is time to cash in on your passion. Crush It. You can buy the book here. If you would like to explore the other books in the book club, check it out here. If you enjoyed reading this article, you will love the ones we send direct to your inbox. Subscribe below.